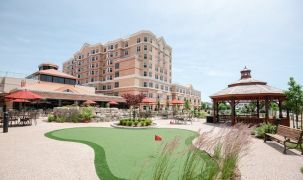 This five-star boutique style, all-inclusive retirement community will outpace all typical expectations of a seniors' home. This home features all the luxury amenities you might have heard about elsewhere (such as an onsite pub, swimming pool, movie theatre) but combined with an exceptionally caring staff, right in the Town Centre. Two of the exceptional features of this home are the large suites and the superb dining room that combines a cozy interior with delicious food. You'll look and feel so much better, with the onsite beauty salon and spa, the exercise room, and the in-house wellness centre. 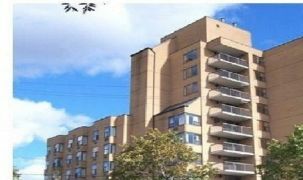 The location of this retirement home adds to the appeal: close to downtown, with ample shopping, near the public library and a variety of health care services. 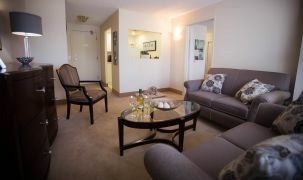 The GO Station and other public transit are also nearby, and the residence is less than a minute off the 401. 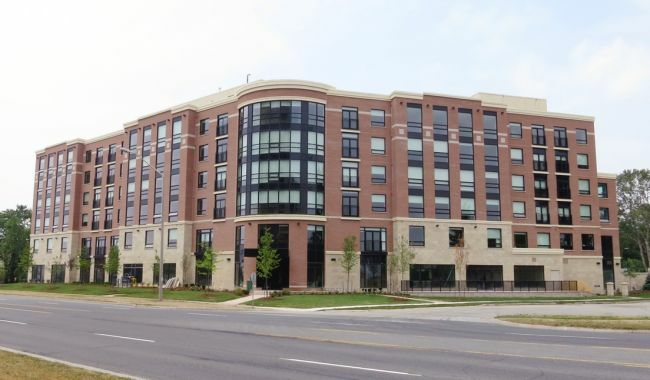 This residence is ideal for Durham Region seniors who want to improve their lives by enjoying the best that life has to give, in a full-fledged care facility easily accessible to families from throughout the Greater Toronto Area (GTA). Perks Café offers delicious baked goods, coffees and teas. The onsite theatre, the V!VAplex, is extremely comfortable individualized seating in a classic theatre environment, complete with popcorn machine and parquet-style floor. Victory Garden lets you can get out and flex your green thumb with other gardener types. Pints! onsite pub is a place where you can hang out, watch sports or play a round of pool. The culinary and dining room staff have been very receptive to [my] requests and concerns. Healthy options are available [here, and] meals are tasty and nutritious. I've been here for almost a year, I've become friends with wonderful people, been fed fantastic meals, and participated in many of the fun-filled activities that are offered here. I enjoy it here.